Most people have a least a basic knowledge of the story of Noah and the ark. Let me give you a brief synopsis of the biblical story of Noah and the ark. God warned Noah that a flood was coming and that he was to build an ark. Noah obeyed and built an ark. It took him 120 years to do so. Supernaturally animals came into the ark and then God did exactly what he warned Noah about. The fountains of the deep broke up, it rained for 40 days. God sent a universal flood that destroyed all of humanity except for the 8 people who were in the ark. There are many who have viewed this story in the bible about Noah and the ark as some type of fable. Some would say that it is a moral story invented to cause people to live in a good way. Some would tell you that there is little evidence that this event actually happened. However, that is absolutely not true. There is a phenomenal book called “The Genesis Flood”. The subtitle is “The biblical record and its scientific implications”. The book was written by John Whitcomb and Henry Morris. Basically, the book proves that a universal flood actually happened by using geological evidence from around the world. People scoff when someone says that a man built a boat large enough to house the animal species of the world. I have news for the mockers and the scoffers. The Bible is true! The Genesis flood actually happened! In other words, many of the same conditions that had to do with God judging the world in the days of the flood are going to be seen as we get to close to the coming of the Lord. If the same conditions exist today as in Noah’s day, then we need to be able to exhibit the same faith that Noah had in his day. What were the conditions of the world in Noah’s day? This verse tells us that the primary condition in Noah’s day was an indifference to spiritual things. Peter tells us that Noah was a preacher of righteousness. Yet for all of his preaching, Noah had little effect on the culture around him. Why? Because of indifference. The same exact thing is happening in our day and age. In the city of Houston, only 15% of people are actually attending church any given Sunday. Houston is the so called buckle of the bible belt. Why? People are indifferent just like in Noah’s day. Everyone in Noah’s day was concerned about eating, drinking, marrying. All the things that make up life were important than the message that Noah gave. Seriously, wouldn’t you think that the supernatural movement of animals into the ark should have been enough for there to have been a huge line of people to come into that ark. But frankly, the people who live in the days of Noah and the ark didn’t care. They were more concerned about eating. They were more concerned about getting drunk. Many believe that the phrase “marrying and giving in marriage” is a reference not to having one partner for your life and getting married in the way we think of it, but multiple, multiple partners. In today’s culture, we are redefining as they did in Noah’s day what marriage was. I stand today for the bible truth that marriage is a lifetime commitment of a man and woman. Today, spiritual indifference is seen in the realm of marriage. Our culture tells us that marriage can be two men, or it can be two women. Our world has said its okay If you have polyamorous relationships. You can have an open marriage. I believe that we are living in the last days. Days like Noah saw. Days like Lot saw. That means we have to have Noah’s kind of faith. Billy Graham once that if God doesn’t judge the world in which we live he will to apologize to Sodom and Gomorrah. The faith of Noah and the ark is for today! Anyone who has read and studied the Word knows that a Tribulation period is coming. It is a huge divine warning from God for those who live on the earth today. Just like Noah and the ark were a warning to the people of that day, bible prophecy is a warning to those in today’s culture. Noah heard a divine warning as well. Hebrews 11:7 says “By faith Noah, being divinely warned of things not yet seen…” Noah was divinely warned of things not yet seen. Why did Noah build the ark? Did he see big storm clouds on the horizon? Is that when he began to build the ark? Did Noah build the ark because he received some kind of weather alert? Did Noah turn his TV to the weather channel and realize bad storms were coming? Did he have a climate specialist on staff who warned him about global warming or global cooling or climate change? No. No. No to any of this. Why did Noah build the ark? He took God at His Word. Noah’s faith was in the divine warning. He recognized the authority of God’s Word. God told Noah He was going to destroy the earth and all life on the earth with a flood. God told Noah to build an ark to save himself and his family and two of all living creatures. Noah and the ark was about Noah obeying God. He listened to the divine warning that God was going to destroy the earth. This generation has also been given a divine warning. Most houses in America still have a bible in them. It may be grandma’s old bible stuck in a box somewhere. Many in our world were raised in the house of God. And we need to understand that this book is filled with divine warnings. It would do us well to start believing those warnings. Some would say, Well, I thought God was all love. God is love my friend, that is why he warns the world, that we need to get right with him. That is why he gave his only begotten Son to die on a cross so that we could be saved. That is why he wrote a book that gave us instruction on how to live. God is love, but God is also just. I can tell you that are dozens of signs today that point to the fact that Christ is soon to return to this earth. When you watch the news and see Israel as a nation, you need to understand that Israel is a fulfillment of biblical prophecy. Every time you make a cashless purchase with a card, or with apple pay, you need to realize that the technology of today makes bible prophecy about buying and selling come to pass. The scripture gives us warnings of the things that will increase in intensity and frequency as we approach the end of the age. Today we see that nations are rising against nations, kingdom against kingdoms. Beyond that mankind is becoming more depraved than ever. All of creation is groaning. Why else do hundreds of birds just fall out of the sky? Why else do dozens of whales just beach themselves? Why do we see pictures of entire harbors filled with dead and rotting fish? We are seeing the beginnings of sorrow that Jesus spoke about. For Christians, for those who are right with God, this is a good thing. It is our blessed hope! But for those who are not right, this is a terrifying event. Can you imagine waking up to news reports that millions of believers have been caught away, raptured, taken up into heaven? It will throw the world into a panic, stock markets will crash, anarchy will take place in some areas. You do not want to be on planet earth in the days after the rapture. You may be reading this and think: I don’t believe that could happen. Nothing like that has ever happened before. I have never seen or heard anything like that ever! Listen Noah was warned about “things not yet seen”. The world has been warned about “things not seen.” In that day, no one had heard of rain or even seen a universal flood. But it happened. This event called the rapture is going to happen. One day every Christian will be caught away. The biggest prayer meeting ever to take place across America will be the day after the rapture. Churches will be packed to capacity with people wanting to know what happened. And that is only the beginning! The bible speaks of the conquest of a world ruler that is known as the Antichrist. The bible speaks of seven years of tribulation in which way over half the world’s population will die. Rivers will turn to blood. Mountains will fall into the ocean. Earthquakes like we have never known. Darkness will cover the face of the earth. Demon like locust will come across the earth and their sting will last for six months. A powerful demonic false prophet will bring the world’s religions together for the sake of unity and peace with lying signs and wonders. The antichrist will receive what appears to be a fatal wound in his head and yet still live. The antichrist or world leader will institute a system of buying and selling in which you must take a mark on your right hand or forehead in order to participate in the economic system. And ultimately the Antichrist will march into the newly built temple in Jerusalem and proclaim himself to be God and demand to be worshipped. Many will be beheaded for Jesus Christ during those. Who is listening today to the divine warnings given in scripture? If those of us who are part of the church of the Lord Jesus don’t listen and don’t share the message. How will the world know? If you want to have faith like Noah, you will listen to the divine warnings given. In Noah’s day there was no written word. But we have the Bible. I believe that many are not really concerned with all these things. Do you realize that in just a few months or years, before you ever retire or get married or your kids grow up…the rapture could occur and everything will change in a moment, in the twinkling of an eye? Noah and the ark is a story about a man who was spiritually awake enough to concern himself with spiritual things. It is time to wake up Oh Sleeper! It is time to have the same type of faith Noah had and hear the divine warnings. 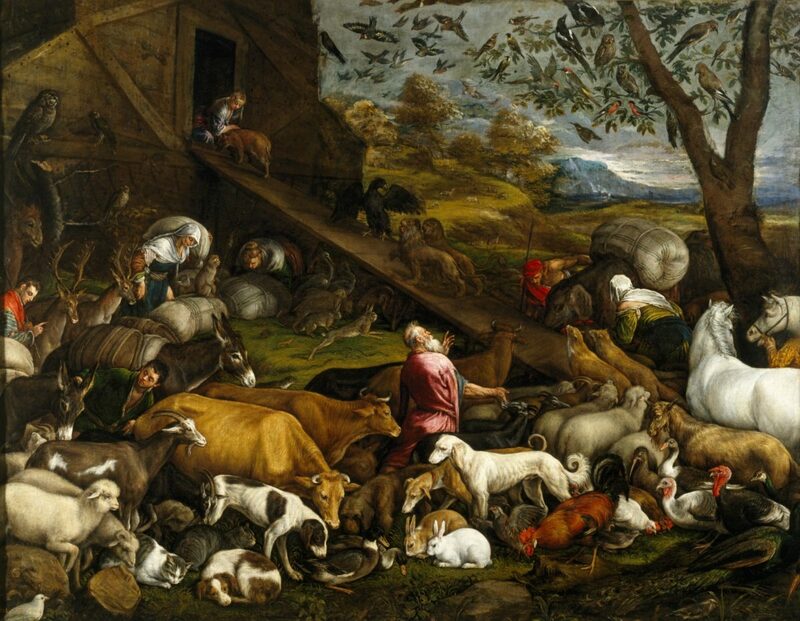 Noah apparently feared God more than he feared the derision and the mocking of his neighbors. Noah apparently had a respect enough for what God had said to him, that every single day, from early morning to late at night, he was busy. Moved by a fear that if that ark was not built, he would perish, and his wife and children would perish. It was that fear of God that moved him every day. I wish today that God would once again cause the church of the Lord Jesus Christ to have a godly fear. Do I need to have be afraid of God? Not in the sense that you are afraid to talk to him or be with him. Buy yes in the sense that you recognize who he is. He is not your buddy up in the sky. He is not the man upstairs. He is God! He is Judge. He is all powerful and all mighty. He needs to be respected. If you have a relationship with God, and you are living and walking in obedience to his commands. You don’t need to be afraid of God. This is talking about having a reverence. This is talking about having a respect for God. But our culture today, even many in the church world have lost their fear of God. Can I remind you that the scripture says in Proverbs 9:10 “The fear of the Lord is the beginning of wisdom…” Noah was moved with fear, and that’s why he prepared an ark. You see, Noah resolved that he was not going to drown. He resolved that he was going to save his own life by obeying God. And there’s nothing wrong with that. When God created me, and when God created you, He put within us an instinct called “self-preservation.” It is a God-given instinct. You know, some people accuse preachers of using fear to motivate people. Everybody is motivated by fear. The doctors use fear to motivate us. They say, “You better lost some weight, or you’ll have a heart attack.” “You need this surgery to save your life.” The insurance people use fear to motivate us. They say, “You’d better have so much insurance or you will be in an accident and they will be able to take everything you have.” When You cross the road; you look both ways; You’re afraid you may get hit by an automobile. There’s nothing wrong with that! It’s just plain common sense. We’re motivated by fear every day in hundreds of ways except in the greatest way sometimes, the spiritual way! Your greatest danger is not the danger of being hit by an automobile or having an accident or heart attack. Do you know what your greatest danger is? Listen to the Lord Jesus Christ! Jesus said, In Matthew 10:28, “And do not fear those who kill the body but cannot kill the soul. But rather fear Him who is able to destroy both soul and body in]hell.” Your greatest danger your supreme danger is that one day you would stand before God, unpardoned, unforgiven, uncleansed. There are places I won’t go, things that I won’t do. Why? I fear God. We are not living in a day when it is smart and intelligent to play around with sin. Yet many do because they have lost the fear of God. Noah and the ark is a giant lesson about properly fearing the Lord. It is not wise to be indifferent to spiritual things. To tell God, I am not going to live a sexually immoral life. It is not wise to be a half-hearted Christian. It is not wise to be lukewarm. It is not wise to have one foot out there in the world and another in the kingdom. It took Noah 120 years to prepare an ark. I have good news for you. You don’t have to build a boat. You don’t have to prepare by building underground bunkers, and storing away food and becoming a prepper. In the New Testament’s 260 chapters, Christ’ s return is mentioned no less than 318 times. Statistically, one verse for every 25 pages of the Bible refers to the return of Jesus Christ in some way, shape, or form. Make no mistake about it: Jesus Christ will come back again, and God has given us specific instructions for what we are to do while we wait. But you do have to make preparation. Noah and the ark is a story about preparations being made and we must do that. What preparation do I need to make? I am not talking about giving mental assent to God, and tipping your hat to him. I am not talking about shaking a preacher’s hand or repeating a prayer without any faith. I am talking about an experience where you are “born again.” Jesus said, you must be born again. I am talking about the moment when you realize that no amount of good works can save you. No amount of trying harder will do it. And that the only hope you have is that Jesus Christ died for you on the cross and that without him you would perish. You put your full trust and confidence in Jesus. When you sincerely say the sinners prayer accepting Christ you will be born again. And on that day an exchange is made. You give to God your sins. You give to God your failures. You give to God your brokenness. You put your faith in him and what he did for you. And an exchange takes place! He gives you his righteousness. Noah…condemned the world and became heir of the righteousness which is according to faith.” I am talking about becoming a new creature in Christ. The old has passed. The new has come. I am not talking about just having a worldly sorrow for your sins. A worldly sorrow says, “I am sorry I got caught. I am sorry that that this is causing me difficulty.” I am saying, pray and seek God until you have a godly sorrow over your sins because that godly sorrow will lead you to repentance. When you repent, you don’t do the things you one did. You have turned from them.When Jesus comes, he doesn’t just come in as Savior, he comes in as Lord! We shouldn’t get caught up in the things that dominate the minds and hearts of nonbelievers, such as what we will eat, drink, and wear. Instead, we should be consumed with our pursuit of the kingdom of God. We should seek, above all, the rule and reign of Jesus Christ in our lives. We should be ready to go. Let me ask you this: If Christ came back today, would you be ready to go with Him? If Christ came back at that moment, would a place where you’re about to go or a thing you’re about to do cause you to be ashamed or embarrassed in any way? If so, then you need to change what you’re doing. If you are not living in a way that is pleasing to Him right now, then His return will come as a great shock and surprise to you. We should want to become more like Jesus Christ each day. If you have a real sense of His imminent return, then it will impact the way you live and will cause you to purify yourself, even as He is pure! We should anxiously await His return. Have you ever been looking forward to seeing someone? You wait for the sound of that person’s car in the driveway. You pull the door open before your friend can even knock. That’s what it means to “anxiously await” someone’s arrival. If anything would cause us hesitancy in saying, “Even so, come, Lord Jesus!” Revelation 22:20 NKJV), then we need to carefully examine our lives.